In the continuation of traditional friendship and a strong association of Pakistani leadership with the People’s Republic of China, Prime Minister Pakistan visited China upon assumption of power in July 2013. This was indeed a key visit since Pakistan is passing through a critical phase of its history; where domestically it is facing the challenges of terrorism and externally being blamed for doing less in the so called war on terror. Earlier to this visit the Chinese Prime Minister, Mr Li visited Pakistan in May, 2013, soon after the General Elections and wished for further promotion of bilateral relationship. The most significant agreement signed between Pakistan and China during the visit of Prime Minister of Pakistan was the Pak-China Economic Corridor. Pakistan has been emphasizing on significance and practicability of this project since 2002. China however had its own priorities and took some time in analyzing it. The new Chinese leadership, however, considered this Pakistani proposal practical as well as beneficial for its economic benefits. During the visit of Chinese Premier Mr Li Kegiang supported this Pakistani proposal of ‘economic corridor’ between Pakistan and China. 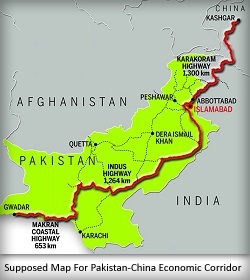 The project once materialized, would be the shortest possible route connecting Pakistan and China through Karakorum Mountains. The Karakorum Highway (KKH) was constructed by both countries in 1970-80s as a joint venture. Today, both countries considered that, this strategic linkage has not been used to its true potentials, thus there is a growing realization that, this overland shortest communication network should be upgraded and used strategically, for the benefit of both countries. Besides boosting the trade and commerce, the corridor will economically upgrade the otherwise poor bordering regions of both countries; Xinjiang autonomous region of China and Gilgit-Baltistan of Pakistan. If exploited properly, Pak-China Economic Corridor would greatly promote commerce and trade between these two countries. Indeed, the proposed economic and trade corridor speak of a long-term set of relationship between both countries. For the China, this corridor would become the shortest possible route for the overland transportation of its energy from the energy rich regions of West and Central Asia, through the Gwadar Port. The Gwadar Port developed by China will now be operated by it after developing the communication network, which would link the port with all major cities in the area. Besides, the Chinese energy transportation routes through sea are rapidly getting under threat by its regional and international rivals, along Malacca Strait and South China Sea. This overland corridor would be the best alternative for the Chinese energy transportation and economic uplift of its western under developed region, ignored so far by this Asia giant, owing to its ethnic makeup and growing insurgent trends. During his visit to Pakistan on May 23, 2013, Chinese Prime Minister Mr Li Kegiang, made a very significant statement once he stated that, “China will give you (Pakistan) every support and assistance and by helping you, we have to help ourselves.” This indeed is the recognition of such a reality, which very less scholars and strategists have debated while describing the strategic basis of Sino-Pak relationship. In fact, during the formative years of People’s Republic of China (PRC), Pakistan was instrumental to global recognition of China, where, Communist won over the Nationalists and world community was more biased towards later. So much so, Republic of China (Taiwan) was allowed to maintain the status of the successor state of primitive China until October 1971. Pakistan along with some other sympathizers of China had to lobby a lot in the Western world and elsewhere among the Muslim world for giving PRC, the actual status of successor state of old China, being the mainland. Later, PRC was given the status of permanent members of United Nations Security Council in November 1971. It was Nixon era in United States and Pakistan undertook a secret diplomacy for bridging the wide gulf between US and PRC. This new era of bilateral relationship brought these two countries closer together in the global politics, thus paving the way for Chine permanent membership of UNSC. ROC is out of UN membership since 1971 and we believe it to be united back to its parent country; People’s Republic of China. Upon detonation of its nuclear device in 1964, China becomes part of declared nuclear states and later a signatory of NPT in 1968. Then after Indo-China War-1962, China remained in a state of constant threat, especially in the wake of US and Western military and financial support to India. Since India was a rival state of Pakistan, therefore major focus of Pakistani defence has been towards India. In a way, India was militarily engaged by Pakistan throughout, practically freeing China from an active Indian threat or aggression. This does not mean that Pakistan has been fighting with India as a proxy to China; however, Indo-Pak military engagement throughout the history has minimized the active military threats for China. Being a Permanent member of the UNSC, China has been supporting the Pakistani view point at the international level. Otherwise, there has been unanimity in the views of Pakistan and China on most of the regional and global issues. China considers Kashmir issue as the main hurdle in the regional prosperity of South Asia, especially; Pakistan and India. It has been emphasizing both countries for the resolution of the issue as per the wishes of its people and in accordance with the UN resolutions. Besides having cooperation in many developmental projects in Pakistan, China is providing all out assistance to Pakistan in the field of ‘civil nuclear technology. Prime Minister Nawaz Sharif inaugurated two Chinese sponsored nuclear power projects of 1100 MW each in Karachi on November 26, 2013. Earlier, China has helped Pakistan in establishing four civil nuclear power plants (including two under construction) at Chasma. China rejected the concern of US and its allies in this Pak-China civil nuclear cooperation.